Sublative Laser is the only Laser technology proven to reduce moderate to severe acne scars for all skin types. The Sublative™ RF applicator is designed to deliver bi-polar radio frequency energy to the skin in a fractional manner, via an array of multi-electrode pins. Microscopic zones of dermis and epidermis are thermally ablated in a grid pattern over the skin surface, thus causing new cell regeneration, stimulating skin's fibroblasts to improve elastin and collagen production. The Sublative RF applicator is designed to deliver radio frequency energy to the skin in a fractional manner, via an array of multi-electrode pins. The array delivers bi-polar RF energy to the skin. The IPL photofacial is a revolutionary method of photo rejuvenation that improves your skin’s texture, tone and appearance. Eliminate your skin discoloration and uneven skin tone with our innovative Intense Pulsed Light (IPL) system. A series of IPL photofacial treatments will diminish flushing or redness of the skin associated with Rosacea, reduce hyperpigmentation caused by sun damage and age, erase broken capillaries, and smooth roughly textured skin. IPL therapy also stimulates new collagen to form, thereby reducing fine lines, minimizing pore size and mild acne scarring, and increasing skin elasticity. There is no down time following an IPL treatment, so you can enjoy your daily activities. During your IPL series, you will notice imperfections fade away as a more radiant, healthier and clearer complexion appears. The combines bi-polar radiofrequency and light energies of elōs technology precisely heat the dermal tissue, stimulating collagen production within the target treatment area. Fine wrinkles are reduced, facial contours improved and overall skin quality reveals a much smoother and even complexion. Most patients see gradual and cumulative results throught their treatment series. The total number of required sessions depends on your skin’s condition. Refirme is a gentle, comfortable treatment requiring no downtime. Many patients return to normal activities after the treatment. Cooling fo the skins surface provides enhanced safety and additional comfort. Laser Genesis is an innovative, technologically advanced way to promote vibrant and healthy looking skin in men and women. The non-invasive laser procedure safely, discretely and effectively treats: fine lines, wrinkles, large pores, uneven skin texture, acne, diffuse redness and scars. You can expect to see consistent results after each treatment. Treatments can be performed in a relaxed, comfortable manner without the use of topical anesthetics or gel. Patients often describe the treatment as relaxing and therapeutic. You will experience a gentle warming of your skin’s surface during the procedure. You can immediately return to normal activities, utilizing sunscreen if participating in outdoor activities. You will not need gel, anesthetic cream or ice prior to treatment. Before the actual Laser Genesis treatment, you will be asked to remove your make-up or moisturizers and, in some cases, you may be asked to shave the area to be treated. Your physician will review and assist with all pre-treatment requirements. 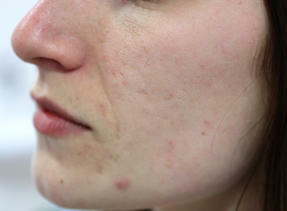 What kind of improvements can you expect with Laser Genesis skin therapy? Over the course of four to five treatments, Laser Genesis can help restore the skin’s youthful glow and appearance. The individual treatment results are subtle, but the overall effect of multiple treatments can be quite dramatic.